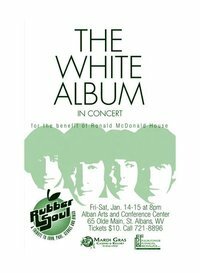 This coming weekend at the Alban Theater, in St. Albans, Charleston’s own Beatles tribute Band, Rubber Soul, will perform the legendary Beatles White Album in its entirety. To get you warmed up for that tonight, we’re bringing you four songs from “The Beatles” performed by some notable musicians…John Lennon, Paul McCartney, George Harrison and, on piano, Ringo Starr. Radio Free Charleston will present a special episode this Tuesday that will show how Rubber Soul is preparing for this weekend’s shows, and we’ll have full details and ticket information in the production notes. Today we bring you John Lennon (With Eric Clapton, Keith Richards and Mitch Mitchell) , Paul McCartney from 2010 The Isle Of Wight Festival, George Harrison from The Concert For Bangla Desh and Ringo Starr with his All-Starr Band from 2003. Lennon kicks it off above. Follow the “read more” link to see the other three. At the end, there’s an extra video treat for Beatles fans.